Background and objective: The aim was to develop and evaluate a pilot version of a knowledge-based system that can identify existing and potential medication-related problems from patient information. This intelligent system could directly support pharmacists and other health professionals providing medication reviews. Methods: Rather than being based on static rules to trigger alerts, this system utilizes a multiple classification ripple-down rules approach, which allows the user to build rules incrementally and improve the accuracy of the knowledge base in identifying medication-related problems while the system is in use, with no outside assistance or training. The system contextualizes the potential drug therapy problems by taking into consideration the patient's demographics, and other medical condition and drugs. The system is capable of both being instructed in the domain of medication review through its routine use by an expert, and acting similarly to the expert when analysing genuine medication review cases. The system was handed over to an experienced clinical pharmacist (expert), with no knowledge or conclusions preloaded into the system. The expert was then able to add the case details and generate the rules required for 126 actual medication review cases. Results: Over 250 rules were generated from the review cases, incorporating demographics, medical history, symptoms, medications and pathology results from these cases. At the completion of the cases, more than 80% of the potential medication-related problems identified by the expert were also detected by the system. The false positive rate, or number of incorrect medication-related problems identified by the system, was <10% overall and was zero for the last 15 cases analysed. The system found significantly more potential medication-related problems than the expert, with the system consistently remaining at least one finding ahead. There was a high incidence of missed potential medication-related problems by the expert, which were automatically repaired by the system. 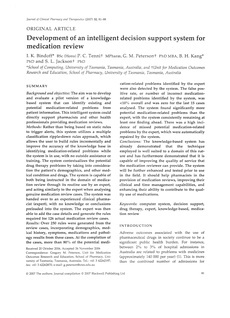 Conclusions: The knowledge-based system has already demonstrated that the technique employed is well suited to a domain of this nature and has furthermore demonstrated that it is capable of improving the quality of service that the medication reviewer can provide. The system will be further enhanced and tested prior to use in the field. It should help pharmacists in the provision of medication reviews, improving their clinical and time management capabilities, and enhancing their ability to contribute to the quality use of medications.